It is commonly held that the second year in a university education program can result in a slump in performance, particularly if the first year was relatively spectacular. My experience racing jets during my first year in 2016 surprised everyone including my own team. It would be tough to top that in a second year effort. None-the-less, our racing team came together in a remarkable way and held on to the objective level of performance set last year. In all racing, but particularly air racing, the results are not necessarily predetermined before the contest happens. In addition to the theoretical air speed capability of the aircraft you must add the intangibles of weather, pilot skill, and random chance. One aircraft that might lead the field can fail to start. At jet racing speeds a fraction of a G in error can result in a pylon cut or low flying penalty allowing the airplane that appears to be behind to actually win the race. Step one in winning a race is to get your airplane started at race time, step two is to fly a clean course with no pylon cuts, low or high flying disqualifications, or boundary violations, and step three is to actually finish in front of somebody else trying to do exactly the same thing. I managed to fly all the heat and trophy races last year without a pylon cut. This year I had my first pylon cut in a heat race. I went to Jeff Turney in a funk and bemoaned my error. His matter of fact response was: “It won’t be your last.” Experienced jet pilots with plenty of pylon racing experience trying to get the absolute best performance from their aircraft cut a fine line around the course and sometimes cut it too close. The Aero Vodochody L-39 I raced in Sep 2017 is named “Reality Czech” and informally called “Kermit” due to its green camouflage paint scheme. It was the aircraft that finished immediately in front of me during the 2016 races. This would seem to offer a step up but there were a couple of new racers with faster aircraft that had been added to the field in 2017. Where I would fall out in qualification and racing time was not at all certain. When I found out I would have Kermit to race in 2017 I had to come up with a racing number. I have a Granddaughter who is named Jacqueline after the famous record setting aviatrix and race pilot, Jacqueline Cochrane. Jackie Cochrane used Race Number 13 with much success on both a Seversky and later a North American P-51. As it turned out, Cochrane painted her Mustang in a bright green color for the races so that seemed auspicious for us in Kermit. During Pylon Racing Seminar and practice races it had seemed to me that Jet Race 7 named “Sarance” and flown by Larry Labriola would be the next fastest racer in the contest this year. What speed you attempt to qualify at can be a science project for some pilots, but Turney says just get a qualification time and the rankings will all be sorted out in the racing heats before the Sunday Trophy races. My thinking was that the best way to finish ahead of Race 7 was to qualify faster and require them to pass us on the course to finish ahead. Passing is difficult between near evenly matched machines and is much more difficult than starting ahead and just staying ahead. You normally call for the clock during the qualification periods and get two laps to set your official time. I was on the course for qualification at the same time as Race 7 and was slightly behind. My perception was that I was closing on Race 7 at a slight rate during the qualification laps. After the timers were finished it turned out that I did qualify faster than Race 7. In fact, when all the times were tallied, Race 7 ended up in the Bronze Class and Race 13 and I ended up in the Silver again, like the year before. Our racing team had two returning members besides the pilot. 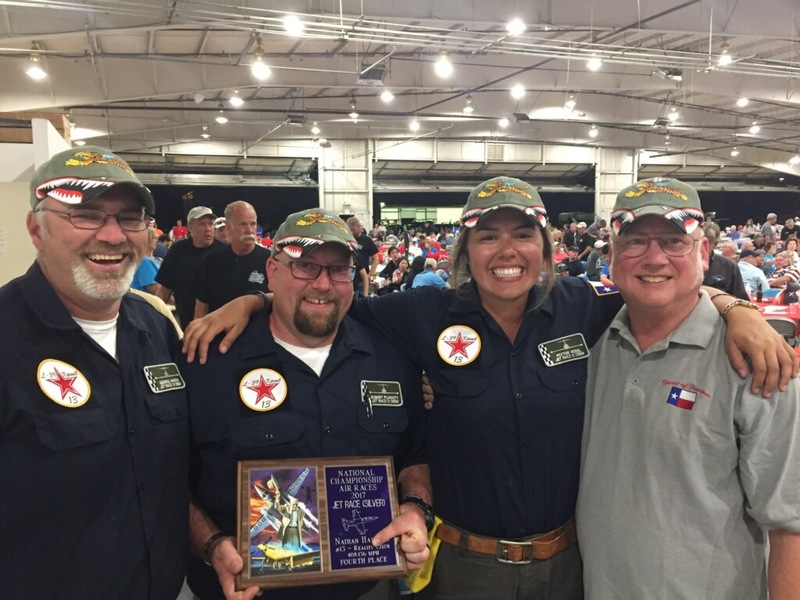 My returning crew was Team Chief Robert Plunkett and Crew Chief George Martin III. Rick Vandam had met a young student pilot and race enthusiast named Peyton Hodel. He asked if we had a place on the team for her. We included her and it was a brilliant addition. Her youthful enthusiasm and desire to learn was a spark to our entire team. Her family are local Reno residents and they offered to help as well. You can have an excellent team in sports and the addition of one superstar makes the entire team better. Even though the L-39 has more performance than the L-29, my impression is that the L-39 can actually be more difficult to fly in close formation. Since I was aware of the peculiarities of engine bypass valves and spool up times for the AI-25TL fanjet, I was conservative on my rejoin closure rates after takeoff. This was noted by the pace pilot and other racing pilots and I modified my approach and readapted to the more aggressive flying demanded at Reno. How fast are you going? Seems a simple enough question, but it isn’t. The airplane’s “airspeed indicator” is actually measuring the dynamic pressure of the air against the instrument and translating that into an indication of miles per hour. Even if you knew the exact relative motion between the airplane and the air mass you are flying through, that still doesn’t tell you how fast you are moving relative to the ground or a specific course on the ground. 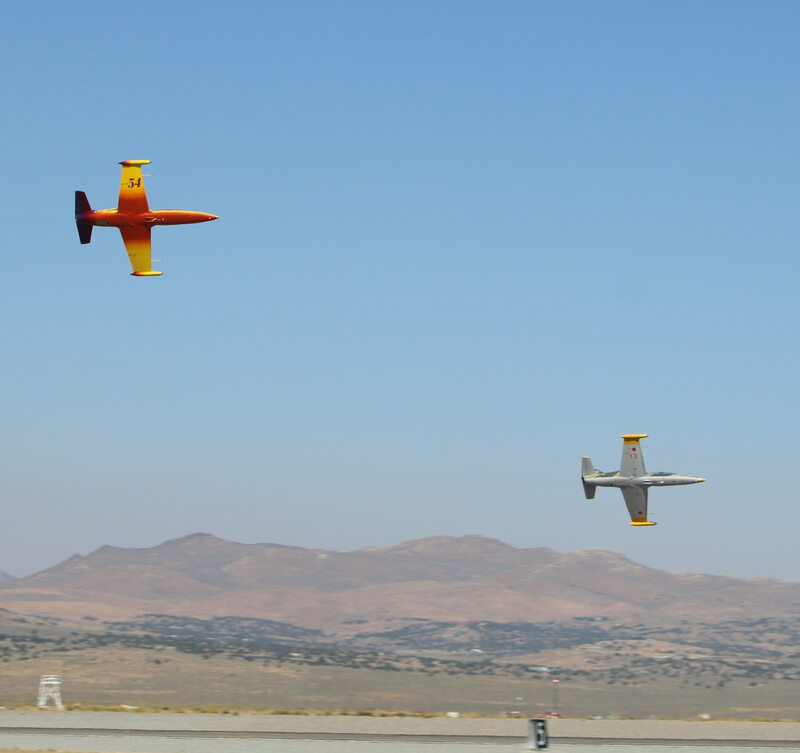 The National Championship Air Races uses a precise camera system to measure the relative time between passing the start pylon on each lap and at the end of the race. This gives you a direct measure of how rapidly you flew the course in minutes and seconds. That measure can and has been translated into a Miles per Hour “speed” using a variety of calculations that have varied over the years as the course and rules have changed. Directly comparing announced race speeds between the 2017 races and previous races is not a true measure of progress. Compare the race times in minutes and seconds and it will take out that variable. During the 2016 races I was close behind and beside Race 54 “Robin 1” flown by experienced jet racing pilot Jeff Turney. In 2017, during the Saturday Heat Race, Robin 1 was disqualified for “low flying.” It is easier to fly tight and precisely on the pylons if you are closer to them, but there are rules on how low you can go. At Jet Racing speeds these limits are easy to exceed. This placed Robin 1 and Jeff behind me in the lineup for the Trophy Race on Sunday. The Jet Silver Trophy Race on Sunday actually broke down into three races in one. First and second place were Pete Stavredes in the L-39 Race 10 “Riff Raff” closely followed by Bob McCormack in the Soko Galeb Race 4 “Soko O’no”. In the middle were Jeff in Race 54 and me in Race 13. In the back were the closely matched Jim Beyer with the L-29 Race 27 “Starship” and Charlie Camilleri with the L-29 “Miss Independence.” Even though I flew a faster course time than ever before, I slipped back one in the Silver standings to Fourth place since Lachie Onslow in L-39 Race 69 “Drop Bear” had returned to race this year and took Third. It was a thrilling race for us and for the fans. So I had a faster airplane, flew faster laps with a lower reported “speed” of 408 mph and moved backwards from Third place to Fourth place in the Silver. I cut my first pylon. But overall our team was better and more efficient, and we all had even more fun. There is no objective measure of the feeling of the satisfaction that comes from obstacles overcome as part of a great team. Anyone who sees the pictures of my team at the awards ceremony after the race would say that even though the plaque is small, we look like big winners in the personal satisfaction and fun categories!